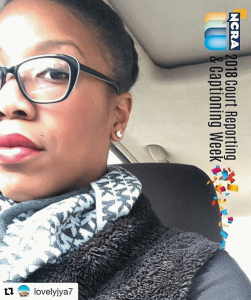 What did you do to make a difference for Court Reporting & Captioning Week? 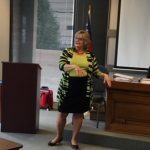 I must share with you all that I had a “peach of a time” visiting the Brown College of Court Reporting in Atlanta, Ga., during Court Reporting & Captioning Week. I was beyond impressed with the school. 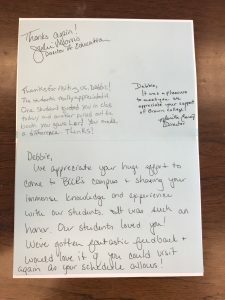 The classroom layouts, the labs, the faculty, and the administration were just amazing – not to mention the best students in the United States. There are 41 daytime students, 32 evening students, and 125 online students. That is phenomenal! We certainly can’t take a chance of losing this program. We all remember those days of the dreaded “guest speaker” when we were in school, but I must say we had a fantastic time. Several of the students who chose to sit in the back of the room were dancing in the aisles and happy-go-lucky when they left. Oh, yes, we had attendance prizes, Valentine’s Day candy bags, and some good ole fun and enjoyment. They love those wonderful reference books the NCRA Store has for sale, plus I rewarded the student I mentor there with a convention registration for being the main reason I went to Brown College of Court Reporting in the first place. Thank you, Kimesha Smith Stallworth, for arranging this opportunity! I thoroughly enjoyed sharing my life and work experience with the students. I’m currently a federal official in St. Louis, Mo., and have been for 15 years. But I had done 25 years of freelance work before that, not to mention two years of CART reporting for a deaf student studying Agricultural Science, some dabbling in the captioning side of life, and providing media coverage for a Senior PGA Tournament on top of the freelance work. Needless to say, I had a lot to share with the students. I could have consumed the entire day. I also went into my professional memberships and covered an array of committees I have served on to show the students that involvement in your professional organizations is priceless! We all have some experiences we can share with students as well as prospective students across the country. I challenge each and every one of you to share a bit of your court reporting or captioning experience with our schools. You can make a difference. You have to “just do it!” Did I mention the school YouTubed the entire evening presentation while it streamed it to the online students? And the best part of this college visit: I got invited back! I also received the nicest “thank you” card. Thank you, Brown College of Court Reporting, especially Mark Green, Jr., director of career services, and Marita Carey, director of administration! Debbie Kriegshauser, FAPR, RMR, CRR, CRC, CLVS, is an official court reporter at the federal level from St. Louis, Mo. NCRA’s Board of Directors kicked off the seventh National Court Reporting & Captioning Week with a video encouraging everyone to celebrate and showcase the profession by sharing with the public what they do. The video was taken during a development meeting held earlier this month at the Association’s headquarters in Reston, Va., and was posted on NCRA’s Facebook page and other social media outlets, where it earned more than 3,200 views. Also at the national level, the 2018 weeklong celebration marked the first time two U.S. representatives recognized the event with official proclamations. The first was made on the floor of the U.S. House by Rep. Bradley Byrne from Alabama, who delivered a one-minute floor speech recognizing Court Reporting & Captioning Week on Feb. 15 at 9 a.m. ET. In addition, longtime supporter U.S. Rep. Ron Kind from Wisconsin also proclaimed the week in a statement he submitted for the official record. Rep. Kind’s wife, Tawni Kind, RMR, CRR, CRC, is an official court reporter and a member of NCRA. Official proclamations were also reported at the state and local levels, including in Alabama, California, Florida, Georgia, Kansas, Texas, South Dakota, and Wisconsin. “Wouldn’t it be great if every week was Court Reporting & Captioning Week? Wow! What an incredible display of the pride we have for our professions. From proclamations to radio and television interviews to demonstrations and more, it was a fantastic week from beginning to end,” said NCRA President Christine J. Willette, RDR, CRR, CRC, a firm owner from Wausau, Wis.
“Each year, I am in awe of the dedication and creativity of those who participate. Congratulations on our success, and thank you all for sharing your passion! Don’t let it end now. Let’s keep it alive,” she added. Throughout the week, members and students took to social media to help spread the word about the opportunities a career in court reporting or captioning can offer using the hashtag #DiscoverSteno. Among the many posts were a number of videos showcasing the profession, including one that explains what stenography is by writing on a white board, which was posted by NCRA Director Christine Phipps, RPR, a firm owner from West Palm Beach, Fla. NCRA Director Max Curry, RPR, CRI, a firm owner from Franklin, Tenn., also posted a video celebrating the profession on social media created by students at Gadsden State Community College’s court reporting program. 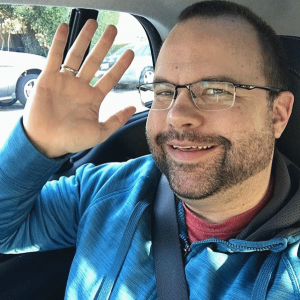 For the last day of the weeklong celebration, NCRA member Richard Scire, RPR, an official court reporter from Sarasota, Fla., posted a video tour of the courtroom where he works. On Feb. 13 and Feb. 14, NCRA’s Instagram was taken over by members Mike Hensley, RPR, a freelance reporter from Evanston, Ill., and Chase Frazier, RMR, CRR, CRC, a captioner from Murrieta, Calif., respectively. The two posted photos, shared their favorite gadgets, hosted live videos, and more. Also recognizing the week on social media was Leah M. Willersdorf, president of the British Institute of Verbatim Reporters. “It’s okay to love what you do and shout about it from the rooftops,” she said. Several members posted blogs about their profession and shared why the career choice was a meaningful one to them, including Lynette Mueller, FAPR, RDR, CRR, a freelance reporter from Memphis, Tenn., who penned Lessons Court Reporters can Learn From Olympians. Another blog post explained Why Court Reporters are the Backbone of Courtrooms and was written by the firm OrangeLegal, based in Orlando, Fla.
Members and court reporting students also took time during the week to participate in career fairs to talk about the many opportunities the profession offers as well as provide demonstrations of realtime. In addition to launching its first A to Z Machine Steno Writing program, several members of the Minnesota Association of Verbatim Reporters & Captioners represented court reporting and captioning at several high school career fairs and at a state homeschoolers association career fair. 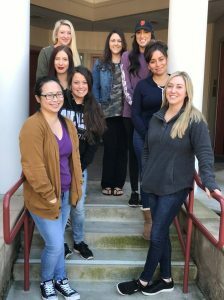 Nicole Bulldis, RPR, an official court reporter from Pasco, Wash., took the opportunity to visit an elementary school and introduce students to the steno machine. Other career days where court reporting and captioning were showcased took place in San Antonio, Texas; Scranton, Pa.; and Olathe, Kan. On Feb. 16, court reporting students from the Madison Area Technical College in Wisconsin traveled to two local high schools to share with students more about how the steno machine works and why a career in the court reporting or captioning fields is attractive. Court reporting students also received visitors to their own programs. Those attending San Antonio College in Texas were able to meet Melinda Walker, RPR, CMRS, chief reporter for the U.S. House of Representatives. In addition, former president of the Florida Court Reporters Association Rosa Naccarato, from Hollywood, and president-elect Sharon Pell Velazco, RPR, from Miami Lakes, spent the day with students at Atlantic Technical College. NCRA wants to thank everyone who participated in the 2018 Court Reporting & Captioning Week and encourages everyone to begin planning now for the 2019 Court Reporting & Captioning Week, which is scheduled for Feb. 10-16. On Feb. 12, Public reported that South Dakota’s Gov. 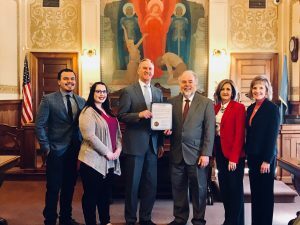 Dennis Daugaard and Chief Justice David Gilbertson proclaimed the week of Feb. 10 as Court Reporting & Captioning Week. The proclamation recognizes the importance of court reporting and captioning professions and is intended to help raise awareness of the growing number of employment opportunities these careers provide. In a press release issued Feb. 12, Planet Depos, based in Washington, D.C., announced that it will offer three scholarships to qualified students and recent graduates of the nation’s court reporting schools in recognition of NCRA’s 2018 Court Reporting & Captioning Week. State associations and NCRA members who celebrate the profession during NCRA’s 2018 Court Reporting & Captioning Week, which is Feb. 10-17, have the chance to win big if they also enter the fourth annual National Committee of State Associations (NCSA) challenge to promote the court reporting and captioning professions to the public. The aim of the challenge is to encourage working professionals to reach out through career fairs and other activities to spread the word about the viable career paths of court reporting and captioning. NCSA will review and tally all submissions by members and state associations, and all entries will be eligible for prizes that include free webinars and event registrations. “The NCSA Challenge is open and waiting on you,” said 2018 NCSA Chair Huey L. Bang, RMR, CRR, an official court reporter from Pass Christian, Miss. 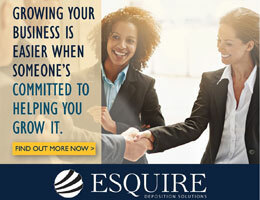 “How can you take part and compete? By sharing what we do and getting the word out about our wonderful profession. Grab your machine, your laptop, and a fellow reporter, and compete to make a difference in the future of court reporting,” he added. Court reporters, captioners, state court reporter associations, and court reporting schools around the country have already been sharing how they plan to celebrate the week and the profession by hosting an array of activities, including visits to high schools to showcase the profession, Veterans History Project interviews, media outreach, and more. Professionals in the field will use these opportunities to demonstrate how the stenographic machine works to capture the spoken word and translate it into written text in real time. 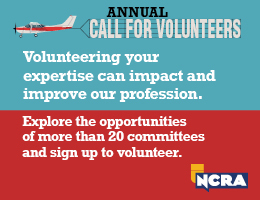 NCRA members will also share their stories with the public about how they became involved in the profession, the interesting events they have reported on, and why their career choice has proven to be one of the best decisions they’ve made. “Reflecting on more than 32 years in the stenographic reporting profession brings a profound sense of pride. Providing instant access to the spoken word and being involved in a multitude of cases involving topics from business to medical to intellectual property, products liability, and personal injury have been educational and rewarding,” said NCRA President Christine J. Willette, RDR, CRR, CRC, an active reporter and owner of Willette Court Reporting in Wausau, Wis.
“Court Reporting & Captioning Week gives our profession an opportunity to showcase and share the skills possessed by stenographic reporters working in the judicial and captioning fields. 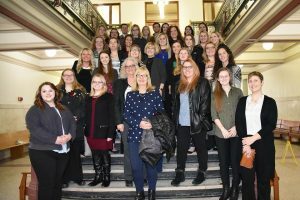 Coming together as a profession to celebrate has become an annual event across the country that is not to be missed,” Willette said. 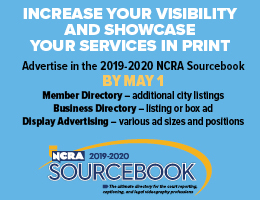 To help celebrate the week, NCRA has made available a vast collection of resources, including informational and marketing materials available on DiscoverSteno.org, which was launched to help promote the profession to high school students, career changers, and veterans. 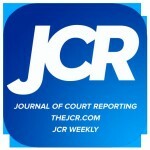 NCRA will also support official legislative recognition of National Court Reporting & Captioning Week and rely on its social media outlets, including Facebook, Twitter, LinkedIn, Instagram, and blogs to reach thousands of people throughout the week to raise public awareness about pursuing a career in the field and the important role court reporters and captioners play in capturing the official record, preserving history, and providing vital services to the deaf and hard-of-hearing communities. Be sure to visit NCRA’s 2018 Court Reporting & Captioning Week resource center at NCRA.org/Awareness. The site has press release and media advisory templates, talking points, logos, brochures about the profession, PowerPoint presentations, quick links, and more.